Can Mold from a Roof Leak Lead to Increased Allergies? Mold is a very common allergen, causing many of the typical allergy symptoms, such as sneezing, congestion, runny nose or watery and itchy eyes, and it could be invading your home due leaks in your roof. According to the Environmental Protection Agency, mold can be a source of allergens, irritants and in some cases, potentially toxic substances such as mycotoxins. Though the presence of mold is common in the outdoors and not always a cause for alarm, inhaling or touching mold spores may cause allergic reactions in sensitive individuals, causing varying degrees of symptoms and even aggravating those with asthma. How does mold grow indoors and what does it look like? First and foremost, mold needs moisture in order to grow and thrives in humid areas. Most mold problems in your home or office originate as a result of some kind of water intrusion, such as roof leaks, blocked rain gutters or plumbing issues. Gutters that are clogged can cause water to back-up and seep into walls, fascia boards and even the roof deck. Even worse is a prolonged roof leak, which allows moisture into your attic space and closer to your building’s main support rafters and air intakes. Combine this prolonged intrusion of moisture with an improperly ventilated and dark attic space, and it becomes a thriving environment for mold growth. Often, we think of mold as the dark black slimy substance we see on the surface of moist surfaces. This is the exterior sign of a problem. However, as mold grows, the mold's roots can penetrate deep inside wood, where it cannot be seen, thus weakening the structure over time and causing unnecessary and very costly lumber damage. • Clean rain gutters and unclog downspouts. Though this is a common DIY project, we strongly recommend having a professional check, seal and clean your gutters annually. •Repair roof leaks in a timely and effective manner with a licensed contractor. Roof tune-ups should be done annually. •Treat any lumber that could be harvesting mold with a diluted bleach. •Ensure your attic has proper ventilation, both intake and exhaust. 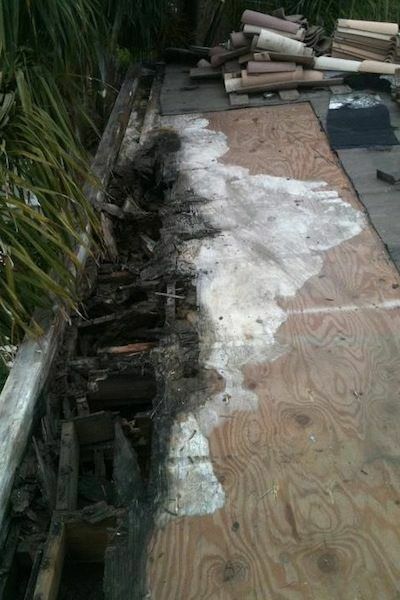 •Have your rooftop checked and cleaned of any mold growth. •Replace any lumber which has been structurally weakened by mold growth and wood rot. •Inspect and change the air filters on your AC unit. If in doubt, call a licensed roofing contractor to inspect your attic, eaves and rooftop, or a licensed plumbing contractor to inspect your pipes for signs of leaks and mold. It may just help you this allergy season and save you lots of unnecessary damage in the future!